I received this stroller as a Shower gift in May, 2016. The rear tires keep going flat, and Britax doesn't have any replacement parts! The color is nice and it is easy to take on and off. Very self- explanatory. Having the option to change the colors in and out is also a nice feature. The color Pack allow you to keep your child and your stroller clean, just remove, wash and use it again! Your stroller always will look like new! This color pack is awesome. The padding is so soft and comfy. The color is awsome. Installing it is a breeze. I recently purchased the Affinity stroller to use with my Britax carseat, and I am so happy with this product! I love the flexibility & adaptability of the stroller. Some of my favorite features: I can make the buggy both forward & rear facing, I can interchange the buggy with the infant car seat, and it is super easy to collapse for travel. I look forward to using my Affinity stroller for many years to come! This stroller was perfect for our little one. I loved how we could change the covers, we we purchased the separate color packs. I bought this stroller when 1st came out, while I was pregnant, I was told it was the top of the line and had great reviews, being top of the line I figured would be around for a while... not even a year later- it's gone out of stores. Can't even buy the extras needed for stroller. Now I am in search of a double stroller- I will not be back for Britax! Due too my stroller being a joke 6 months later, and my britax car seat being recalled while using it. I've purchased several color packs and each one I purchase, I am so satisfied with. Albee has definitely made my experience with Britax products an amazing one! This stroller is really a steal at these prices I have no idea why they are discontinuing it. The green is a great gender neutral color, we are using it with a girl and it goes great with pink. The tires on my daughters Bob Motion are a non standard size and do not meet ISO standards, they are worn out and not replaceable. What junk for an expensive stroller. This is going up on U Tube. I'm a single mom and needless to say I was a bit worried about the money that I would end up spending on baby products for my son. That being said, I didn't want to purchase items that were sub par and not worth my time or money, even if they are less expensive. After much research I decided on the Britax Affinity Stroller and the B-Safe 35 Elite Car seat, for their safety ratings. What I got was more than peace of mind for it's safety... I also got beauty, ease and excellence! I couldn't believe how proud (and fancy) I felt knowing that I was able to provide my son with something that will fortunately enhance our day to day life! Thank you Britax for making wonderful products! First time customer, and I won't be a last! I absolutely love this stroller!! The best feature is being able to easily click in different attachments and go! We use the affinity stroller along with the britax bsafe 35 elite car seat, the bassinet and the normal attachment the stroller comes with. Britax is a great company to deal with! They sent me 2 new back tires for my stroller due to one having a small leak " I strolled over something sharp" The tires take seconds to replace. Thank you for making my life easier! We wanted something sturdy but beautiful to look at. This stroller is awesome. It is well constructed, easy to push, and comes with plenty of extras. We also bought the car seat. We really love the convenience of simply transferring it from the car onto the stroller frame. I wish it were a bit lighter but it's not a big deal. My son is ten months old and I'm happy to help him choose Britax products. Regardless of color or quality are so that we are satisfied. I've owned six strollers over eleven years for my three children. The Affinity is by far my absolute favorite! It is unbelievably easy to steer and maneuver. I have used it indoors, on city sidewalks as well as on a vacation to Yellowstone. It has never disappointed. My son loves that he can sit up in it and see everything. We often pull it right up to tables in restaurants instead of using a high chair. And when reclined it was comfortable enough for him (at 6 months old) to sleep all night when we stayed in a hotel that didn't have any cribs. We also get tons of compliments on how sleek and "cool" it looks. Overall, my only negative (which is incredibly minor) is that the color liner for the cargo basket doesn't stay in well. But, easy enough to just leave it out, no one even knows it's missing! Thanks for another great product, Britax! I bought the stroller for my first baby a year and a half ago. It exceeded all of our expectations, it's really secure, great design, so practical. However, now that I'm pregnant of my second child and I found out it has so few compatible accessories with it. For example, the stroller board that it would be so useful to me having soon two kids under 2 is compatible with most strollers but no with affinity. Having said that I want to make clear despite of this I'm really pleased with its quality and confort. It's the most expensive but it totally worths it. I love Britax products! I bought this for my new baby after researching A LOT of different strollers and stroller systems. I don't regret my purchase at all. I have loved every minute. It's easy to maneuver and push and super light yet durable. 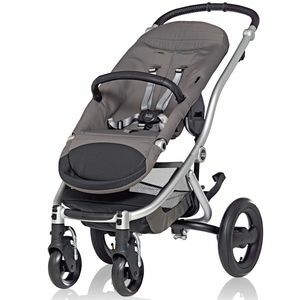 I had to buy the bassinet attachment separate which I would have loved it if it came with, but it's an awesome stroller. I'd purchase it again. First time Brtitax buyer and I guaranty it's not my last! I'm so ready to put my products to use with fashionable look it gives you! Different color options for your Britax Affinity I got one for every acation. its so handy to remove car seat, to stroller, even to bassinett! Awesome you'll love it and be satisfied with your purchase. You'll always have a smile on your face when you use Britax products! This is the best stroller I have ever used! Out of all the strollers that I have bought that are similar to the Affinity, the Affinity is the best. 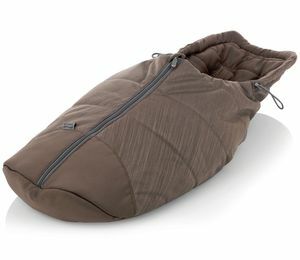 Is the most lightweight, has the most spacious basket, the smallest fold and has many options. I am very glad with my purchase and will put it to use for all the kids I have. I bought this for my first child in 2014. This stroller has been wonderful and has held up very well. It looks brand new still except for a couple scratches on the frame.My favorite thing about it is that it can go anywhere! Through gravel and grass and it's still super easy to push. The wheels are fantastic! We have been using this system for just over a year. We spent much time researching strollers for our first baby and thought this was the closest to our perfect stroller. However, as much as we wanted to love it we have had numerous issues with construction. The frame and canopy from the color pack both have been replaced by the company due to malfunction. The seat recline levers for adjustment have never worked great but by time we finally got fed up with it it was past the years since purchase as we bought the stroller months before our baby arrived. So reclining is a constant battle. We have since purchased another stroller that functions easier and use more frequently now, which is disappointing considering the price point of this stroller at the time of purchase. We did really enjoy using it as a travel system when baby fit in his infant car seat but we think there are other strollers that are better made. It does maneuver nicely and is good for one handed steering. Unfortunately we would not recommend the Affinity. I love the removable seat pad and multiple seat positions! Great sun and rain cover! My only wish is that it would have a larger storage basket underneath! Very user friendly. Easily portable. Conveniently fits in trunk of sedan. Smooth maneuvering and high quality stroller! I read many positive reviews online about Britax Affinity stroller so I purchased one. This stroller is amazingly easy to assemble, easy to operate. Very smooth wheels and it maneuvers easily with one hand. 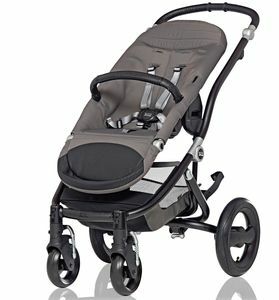 Very rigid frame and light weight compared to similar stroller from competitor's brand. I love the adjustable handle as well as the versatile positioning of the modular seat. Lack of cup holder is a little inconvenient but I purchased the Britax Stroller Organizer and it was a perfect match. I am very happy with this stroller and I highly recommend this to everyone! 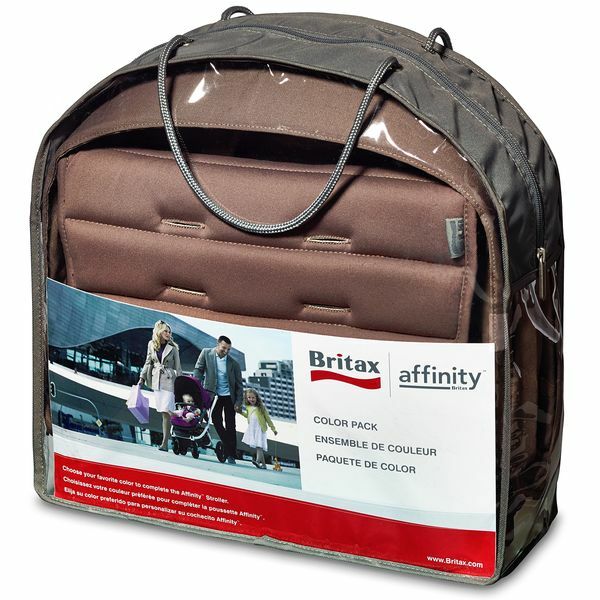 The Britax affinity color pack in black is super cute. The color is deep black which I love. The material it's super easy to clean up. Overall, I would definitely recommend my friends to buy it. We've used this stroller with the Britax B-Safe 35 Car Seat, the Britax Affinity Bassinet, and the included stroller seat. Overall the stroller is solid, safe, and a pleasure to use. My only complaints are minor. The weight distribution on the front wheels can get a little off causing them to lose touch with the ground and judder as others have noted. And the cargo space leaves a lot to be desired when compared to other strollers...please give us a bigger cargo option! I bought the britax affinity today. My baby girl fits in it perfectly. I love that it have different colors I can change it to. I just put my new Affinity stroller together. It's very sleek. I started pushing it forward in the house and the front wheels do a weird wobbly thing. Not a totally smooth ride. I like the stroller, however, my main concern is that the seat does not sit completely upright. The baby will be laying back a bit at all times. I am thinking this is reason enough to return it to the store. My girlfriend has the B-Agile model and she has the same complaint with her seat. We've had this stroller for about 9 months and love it. Cannot recommend it enough! This stroller handles so well, and we especially love how easily the Britax car seat clips in and out. It's great for getting in and out of cabs easily. The wheels also come on and off really easily if you need to fit it in a tight space. I prefer it to my friends' similar Uppababy and Bugaboo strollers. The only complaint I can think of is that the sunshade needs to lock into the lowest position more firmly. It's kinda big when folded, but has a great ride (except if you push down on the handle too much, then one of the front wheels does this weird wobble thing). My only grumps about this stroller is that the seat does not sit fully upright when facing forward (which kinda makes me want to just buy a new stroller) and folded size. Overall, I like it and am glad I got it. My wife and I love the stroller. We do wish there were more accessories for it. Also we wish the seat didn't move as much as it does, seems pretty loose even though it is snapped in tight, minor things. Love the look of the stroller as well as how sturdy it is. The color pack is awesome. Britax, you've done it again! This stroller is amazing! So versatile and easy to use. It just feels so nice and can be used for years! Love it in just plain black. I've wanted a Britax stroller for the last few years and I'm glad I waited - this stroller in black is a dream! Overall very nice stroller. I like the design and the fashionkit options. I wish canopy would be bigger, specially when the seat is laying flat position. Also the raincover coming with it seems that it won't hold the water out well. I noticed that the seat seems loose even when it's locked on it's place. It rocks a little bit. Not a big deal tho. Overall very nice stroller. I like the design and the fashionkit options. I wish canopy would be bigger, specially when the seat is laying flat position. Also the raincover coming with it seems that it won`t hold the water out well. I noticed that the seat seems loose even when it`s locked on it`s place. It rocks a little bit. Not a big deal tho. I got this stroller to try after my B-ready. I love the B-ready but wanted to check out this one since it's a little smaller. I love the lightweight of it and the safety straps feature. My son is now 9 months and love to sit up in it. The canopy with the air flow screen is great because you can see your child through it too. I love the larger shade area that it covers and the cushion of the seat. The downfall compared to my B-ready is I'm used to a cup holder and a larger storage space. So this isn't the stroller if you need the storage but definitely light and easy to use. It fits in my trunk much better since I have a small car. Awesome Stroller! So impressed with the comfort of this stroller, my 6 month old son loves it as well as my 3 year old daughter. The soft quilted fabric sets it apart from other strollers. Very easy to adjust to be able to accommodate both kids, easy to recline, face in/out, breakdown. Love the wheels as we live in a neighborhood with high curbs, they are super easy to maneuver and offer an extremely smooth ride. Leather handle bar feels luxe. As we live in sunny weather year round, I wish the sun shade extended further down to cover the full body and that the storage area was a little bigger. 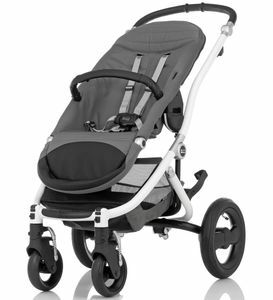 We love our Affinity and it has quickly replaced our previous strollers as our favorite! We received our stroller a few weeks ago and we are so happy so far! First, it was so easy to put together that I was actually able to do it without any husband-assitance. That's rare and a testament to the designers attention to parent-friendly details. My babe is very happy in the stroller and I love some of the little details: adjustable handlebar, magnetic closures, adjustable footbed for child, large storage underneath. The seat also removes very simply and the entire stroller collapses in an instant when on the go. This stroller is very good, very easy to walk with, suspension on the wheels is very good and it's looks beautifull. Make a statement everywhere you stroll. Show off your signature style by choosing one—or more—of the six bold Color Packs that is needed to complete your Affinity stroller. Made of high-quality fabrics and custom tailored to complement the clean lines of the Affinity stroller, each Color Pack includes a canopy, shoulder and buckle pads, basket liner, and machine-washable padded seat liner. Updating your stroller is easy—simply switch out Color Packs as seasons or tastes change.